"Well, I hadn't. But I was just going to." The papa lay quiet a while. The fact is, he had not thought up any story at all; and he was so tired of all the stories he used to tell his own children that he could not bear to tell one of them, though he knew very well that the niece and nephew would be just as glad of it as if it were new, and maybe gladder; for they had heard a great deal about these stories, how perfectly splendid they were--like the Pumpkin-Glory, and the Little Pig that took the Poison Pills, and the Proud Little Horse-car that fell in Love with the Pullman Sleeper, and Jap Doll Hopsing's Adventures in Crossing the Continent, and the Enchantment of the Greedy Travellers, and the Little Boy whose Legs turned into Bicycle Wheels. At last the papa said, "This is a very peculiar kind of a story. It's about a Prince and a Princess." "Well, where was I?" This was another of the papa's tricks to gain time. Whenever he could not think of anything more, he always asked, "Well, where was I?" He now added: "Oh yes! I remember! Well, once there were a Prince and a Princess, and their names were Butterflyflutterby and Flutterbybutterfly; and they were both twins, and both orphans; but they made their home with their fairy godmother as long as they were little, and they used to help her about the house for part board, and she helped them about their kingdom, and kept it in good order for them, and left them plenty of time to play and enjoy themselves. She was the greatest person for order there ever was; and if she found a speck of dust or dirt on the kingdom anywhere, she would have out the whole army and make them wash it up, and then sand-paper the place, and polish it with a coarse towel till it perfectly glistened. The father of the Prince and Princess had taken the precaution, before he died, to subdue all his enemies; and the consequence was that the longest kind of peace had set in, and the army had nothing to do but keep the kingdom clean. That was the reason why the fairy godmother had made the General-in-Chief take their guns away, and arm them with long feather-dusters. They marched with the poles on their shoulders, and carried the dusters in their belts, like bayonets; and whenever they came to a place that the fairy godmother said needed dusting--she always went along with them in a diamond chariot--she made the General halloo out: 'Fix dusters! Make ready! Aim! Dust!' And then the place would be cleaned up. But the General-in-Chief used to go out behind the church and cry, it mortified him so to have to give such orders, and it reminded him so painfully of the good old times when he would order his men to charge the enemy, and cover the field with gore and blood, instead of having it so awfully spick-and-span as it was now. Still he did what the fairy godmother told him, because he said it was his duty; and he kept his troops supplied with sudsine and dustene, to clean up with, and brushes and towels. The fairy godmother--"
"THE GENERAL-IN-CHIEF USED TO GO BEHIND THE CHURCH AND CRY." "It was a very big diamond," said the papa; and he seemed to forget all about being mad, or else he had thought up some more of the story to tell, for he went on just as if nothing had happened. 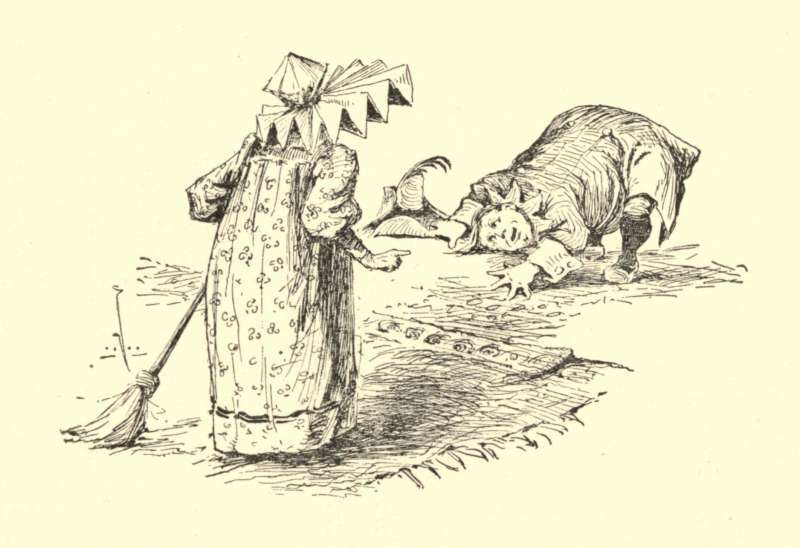 "The fairy godmother was so severe with the dirt she found because it was a royal prerogative--that is, nobody but the King, or the King's family, had a right to make a mess, and if other people did it, they were infringing on the royal prerogative. "You know," the papa explained, "that in old times and countries the royal family have been allowed to do things that no other family would have been associated with if they had done them. That is about the only use there is in having a royal family. But the fairy godmother of Prince--"
The children rose up into a capital A again, and whispered, "He didn't catch us that time," and fell back, laughing, and the papa had to go on. "The fairy godmother thought she would try to bring up the Prince and Princess rather better than most Princes and Princesses were brought up, and so she said that the only thing they should be allowed to do different from other people was to make a mess. If any other persons were caught making a mess they were banished; and there was another law that was perfectly awful." "What-was-it-go-ahead?" said the nephew, running all his words together, he was so anxious to know. "Why, if any person was found clearing up anywhere, and it turned out to be a mess that the royal twins had made, the person was thrown from a tower." "Did it kill them?" the niece inquired, rather faintly. "Well, no, it didn't kill them exactly, but it bounced them up pretty high. You see, they fell on a bed of India-rubber about twenty feet deep. It gave them a good scare; and that's the great thing in throwing persons from a high tower." The nephew hastened to improve the opportunity which seemed to be given for asking questions. "What do you mean exactly by making a mess, uncle?" 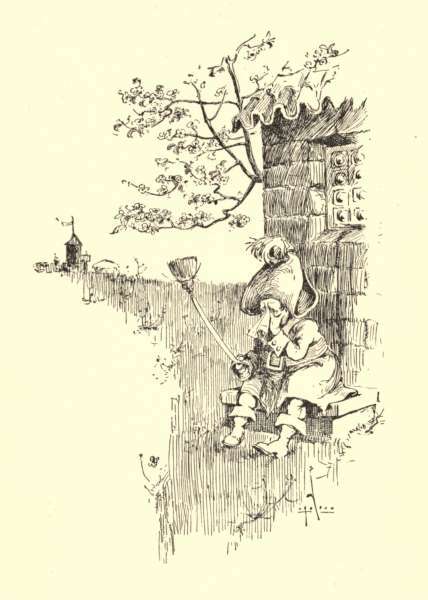 "Oh, scattering scraps of paper about, or scuffing the landscape, or getting jam or molasses on the face of nature, or having bonfires in the back yard of the palace, or leaving dolls around on the throne. But what did I say about asking questions? Now there's another thing about this story: when it comes to the exciting part, if you move the least bit, or even breathe loud, the story stops, just as if you didn't know which was the Prince and which was the Princess. Now do you understand?" The children both said "Yes" in a very small whisper, and cowered down almost under the clothing, and held on tight, so as to keep from stirring. "THE YOUNG KHAN AND KHANT ENTERED THE KINGDOM WITH A MAGNIFICENT RETINUE." The papa went on: "Well, about the time they had got these two laws in full force, and forty or fifty thousand boys and girls had been banished for making a mess, and pretty nearly all the neat old ladies in the kingdom had been thrown from a high tower for cleaning up after the Prince and Princess Butterflyflutterby and Flutterbybutterfly, the young Khan and Khant of Tartary entered the kingdom with a magnificent retinue of followers, to select a bride and groom from the children of the royal family. As there were no children in the royal family except the twins, the choice of the Khan and Khant naturally fell upon the Prince--"
"Correct. It also happened that the Khan and the Khant were brother and sister; but if you can't tell which was the brother and which was the sister, the story stops at this point." "Why, but, uncle," said the little girl, reproachfully, "you haven't ever told us which is which yourself yet!" "I know it. Because I'm waiting to find out. You see, with these Asiatic names it's impossible sometimes to tell which is which. You have to wait and see how they will act. If there had been a battle anywhere, and one of them had screamed, and run away, then I suppose I should have been pretty sure it was the sister; but even then I shouldn't know which was the Khan and which was the Khant." "Well, what are we going to do about it, then?" asked the nephew. "I don't know," said the papa. "We shall just have to keep on and see. Perhaps when they meet the Prince and Princess we shall find out. I don't suppose a boy would fall in love with a boy." "No," said the niece; "but he might want to go off with him and have fun, or something." "That's true," said the papa. "We've got to all watch out. Of course the Khan and the Khant scuffed the landscape awfully, as they came along through the kingdom, and got the face of nature all daubed up with marmalade--they were the greatest persons for marmalade--and when they reached the palace of the Prince and Princess they had to camp out in the back yard, and they had to have bonfires to cook by, and they made a frightful mess. "Well, there was the greatest excitement about it that there ever was. The General-in-Chief kept his men under arms night and day, and the fairy godmother was so worked up she almost had a brain-fever; and if she had not taken six of aconite every night when she went to bed she would have had. You see, the question was what to do about the mess that the Khan and Khant made. They were visitors, and it wouldn't have been polite to banish them; and they belonged to a royal family, and so nobody dared to clean up after them. The whole kingdom was in the most disgusting state, and whenever the fairy godmother looked into the back yard of the palace she felt as if she would go through the floor. "SHE WAS GOING TO TAKE THE CASE INTO HER OWN HANDS." "Well, it kept on going from bad to worse. 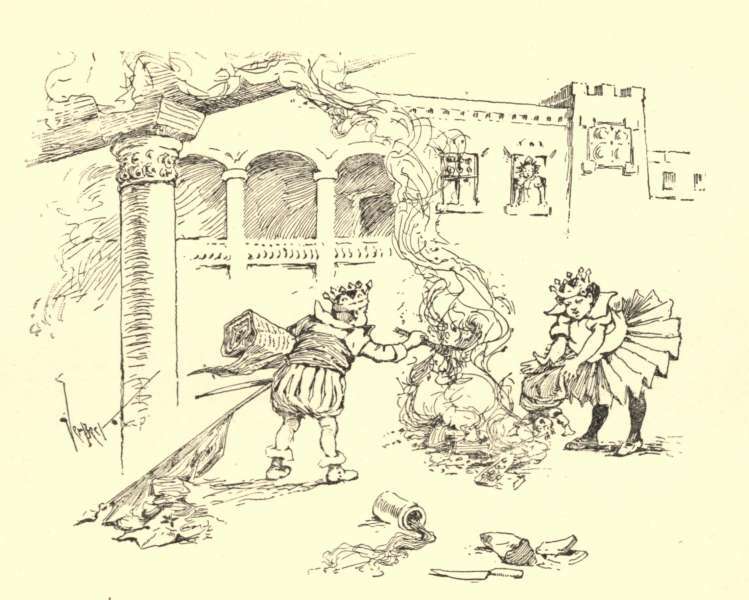 The only person that enjoyed herself was the wicked enchantress; she never had such a good time in her life; and when the fairy godmother got hold of the Grand Vizier and the Cadi, and told them to make a new law so as to allow the army to clean up after royal visitors, without being thrown from a high tower, the wicked enchantress enchanted the whole mess, so that the army could not tell which the Prince and Princess had made, and which the Khan and Khant had made; they were all four always playing together, anyway. "It seemed as if the poor old fairy godmother would go perfectly wild, and she almost made the General crazy giving orders in one breath, and taking them back in the next. She said that now something had got to be done; she had stood it long enough; and she was going to take the case into her own hands. She saw that she should have no peace of her life till the Prince and Princess and the Khan and Khant were married. She sent for the head Imam, and told him to bring those children right in and marry them, and she would be responsible. "The Imam put his head to the floor--and it was pretty hard on him, for he was short and stout, and he had to do it kind of sideways--and said to hear was to obey; but he could not marry them unless he knew which was which. "THE IMAM PUT HIS HEAD TO THE FLOOR." "The General got her to explain herself, and then he understood that she wanted him to have a grand review and sham battle of all the troops, in honor of the Khan and Khant; and the whole court had to be present, and especially the timidest of the ladies, that would almost scare a person to death by the way they screamed when they were frightened. The General was just going to say that the guns and cannon had all got rusty, and the powder was spoiled from not having been used for so long, with the everlasting cleaning up that had been going on; but the fairy godmother stamped her foot and sent him flying. 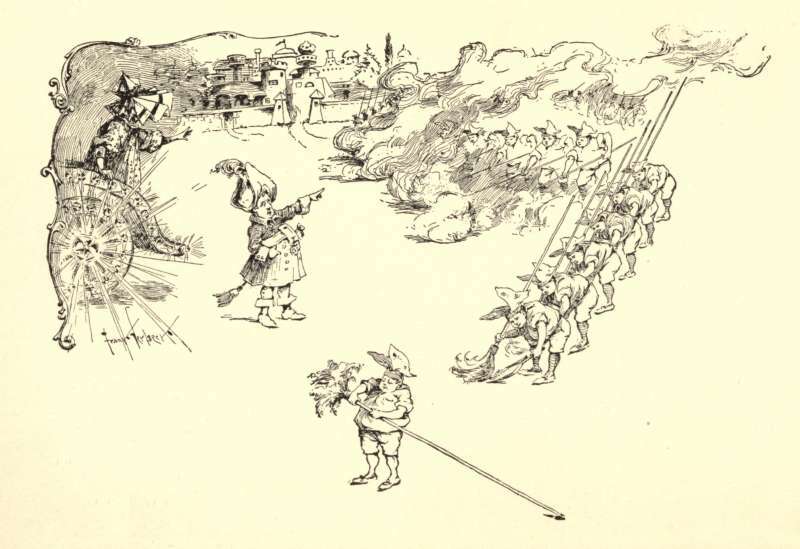 So the only thing he could do was to set all the gnomes at work making guns and cannon and powder, and about twelve o'clock they had them ready, and just after lunch the sham battle began. "The troops marched and counter-marched, and fired away the whole afternoon, and sprang mines and blew up magazines, and threw cannon crackers and cannon torpedoes. There was such an awful din and racket that you couldn't hear yourself think, and some of the court ladies were made perfectly sick by it. They all asked to be excused, but the fairy godmother wouldn't excuse one of them. She just kept them there on the seats round the battle-field, and let them shriek themselves hoarse. So many of them fainted that they had to have the garden hose brought, and they kept it sprinkling away on their faces all the afternoon. "THEY BEGAN TO SCREAM, 'OH, THE COW! THE COW!'" "But it was a failure as far as the Khan and the Khant were concerned. 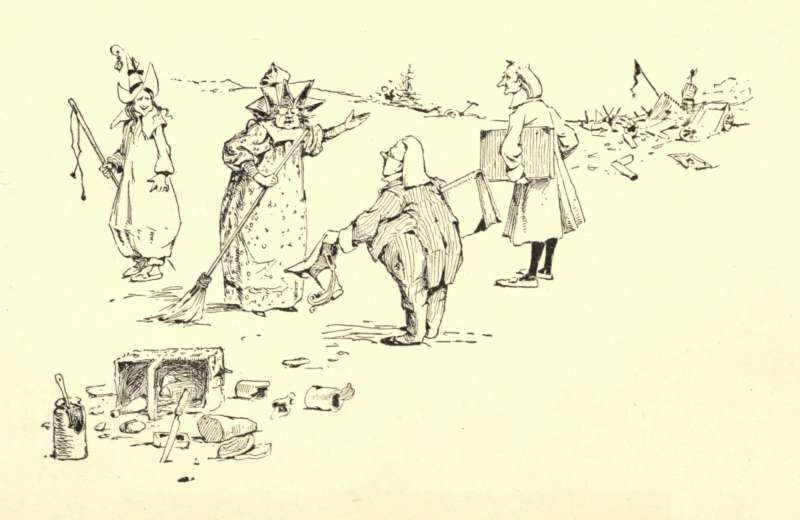 The fairy godmother expected that as soon as the loudest firing began, the girl, whichever it was, would scream, and so they would know which was which. But the Khan and Khant's father had been a famous warrior, and he had been in the habit of taking his children to battle with him from their earliest years, partly because his wife was dead and he didn't dare trust them with the careless nurse at home, and partly because he wanted to harden their nerves. So now they just clapped their hands, and enjoyed the sham battle down to the ground. "About sunset the fairy godmother gave it up. She had to, anyway. The troops had shot away all their powder, and the gnomes couldn't make any more till the next day. So she set out to return to the city, with all the court following her diamond chariot, and I can tell you she felt pretty gloomy. She told the Grand Vizier that now she didn't see any end to the trouble, and she was just going into hysterics when a barefooted boy came along driving his cow home from the pasture. 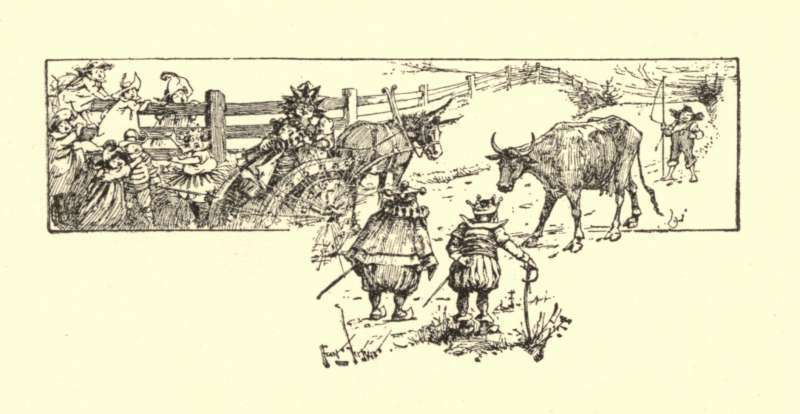 The fairy godmother didn't mind it much, for she was in her chariot; but the court ladies were on foot, and they began to scream, 'Oh, the cow! the cow!' 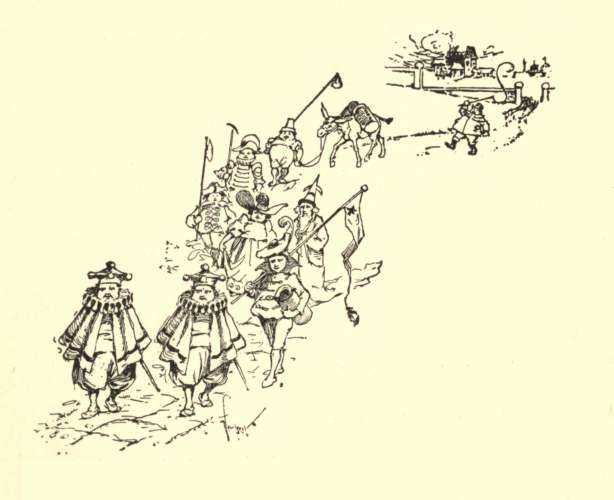 and to take hold of the knights, and to get on to the fence, till it was perfectly packed with them; and who do you think the fairy godmother found had scrambled up on top of her chariot?" "The Khant! The fairy godmother pulled her inside and hugged her and kissed her, she was so glad to find out that she was the one; and she stopped the procession on the spot, and she called up the Imam, and he married the Khant to Prince--"
The papa stopped, and as the niece and nephew hesitated, he said, very sternly, "Well?" "Oh no! That won't work. I've had that sort of thing tried on me before, and it never works. I heard you whispering what you would do, and you have simply added the crime of double-dealing to the crime of inattention. The story has stopped, and stopped forever." The nephew stretched himself and then sat up in bed. "Well, it had got to the end, anyway." "Oh, had it? What became of the wicked enchantress?" The nephew lay down again, in considerable dismay. "Uncle," said the niece, very coaxingly, "I didn't say it had come to the end." "But it has," said the papa. "And I'm mighty glad you forgot the Prince's name, for the rule of this story is that it has to go on as long as any one listening remembers, and it might have gone on forever." "I suppose," the nephew said, "a person may guess?" "He may, if he guesses right. If he guesses wrong, he has to be thrown from a high tower--the same one the wicked enchantress was thrown from." "There!" shouted the nephew; "you said you wouldn't tell. How high was the tower, anyway, uncle? As high as the Eiffel Tower in Paris?" "Not quite. It was three feet and five inches high." "Ho! Then the enchantress was a dwarf!" "Who said she was a dwarf?" "There wouldn't be any use throwing her from the tower if she wasn't." "I didn't say it was any use. They just did it for ornament." This made the nephew so mad that he began to dig the papa with his fist, and the papa began to laugh. He said, as well as he could for laughing: "You see, the trouble was to keep her from bouncing up higher than the top of the tower. She was light weight, anyway, because she was a witch; and after the first bounce they had to have two executioners to keep throwing her down--a day executioner and a night executioner; and she went so fast up and down that she was just like a solid column of enchantress. She enjoyed it first-rate, but it kept her out of mischief." "Now, uncle," said the niece, "you're just letting yourself go. What did the fairy godmother do after they all got married?" "Well, the story don't say exactly. But there's a report that when she became a fairy grandgodmother, she was not half so severe about cleaning up, and let the poor old General-in-Chief have some peace of his life--or some war. There was a rebellion among the genii not long afterwards, and the General was about ten or fifteen years putting them down." The nephew had been lying quiet a moment. Now he began to laugh. "What are you laughing at?" demanded his uncle. "The way that Khant scrambled up on top of the chariot when the cow came along. Just like a girl. They're all afraid of cows." The tears came into the niece's eyes; she had a great many feelings, and they were easily hurt, especially her feelings about girls. "Well, she wasn't afraid of the cannon, anyway." "That is a very just remark," said the uncle. "And now what do you say to breakfast?" The children sprang out of bed, and tried which could beat to the door. They forgot to thank the uncle, but he did not seem to have expected any thanks. Add Butterflyflutterby and Flutterbybutterfly to your own personal library.